Some corners have deceptive camber or radius and this has been catching motorcyclists out for years, especially on the 130km Southern Coromandel Loop which includes Kopu, Whangamata, Waihi, and Paeroa. This area has seen a disproportionately high number of motorcyclist deaths: while only 1-3% of all vehicles that use that route are motorcycles, motorcyclists were involved in 44% of all fatal and serious injury crashes. The Safer Rides multi-agency project, which is aimed at improving motorcyclist safety, has a number of initiatives, including these road markings which warn riders to slow down and help them improve their lane positioning. It changes the way a road looks, giving riders advanced warning of the actual geometry of the curve ahead. 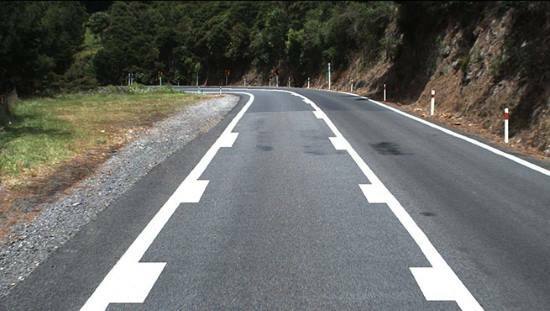 The markings have been trialled in different areas in New Zealand. They narrow the perception of the road, which leads to motorcyclists slowing down. Michelle Te Wharau, Transport Agency Principal Safety Engineer, says the effect these markings have on rider speed and lane position will be closely monitored and analysed. “The lane markings are just one of a series of safety improvements being trialled. Other initiatives include upgraded signage, road surface improvements, removal or protection of roadside hazards as well as new rescue helicopter landing areas” says Michelle. The Transport Agency is working in partnership with other road safety groups, including Motorcycle Safety Advisory Council; NZ Police; ACC; Thames-Coromandel and Hauraki District Councils; Waikato Regional Council as well as motorcycling user groups.